Central Seat Allocation Board will conduct CSAB 2019 which constitutes of NITs, IIITs, CFTIs and other reputed and deemed universities. The admission in these institutes is based on the rank secured by applicants in JEE Main 2019. CSAB UT and SFTI are conducted for Union Territories candidates and Self Financing Technical Institutes respectively. Applicants belonging to Northeastern states and Union Territories can apply for admission through CSAB NUET 2019. Seats are allotted on the basis of merit obtained by the candidate and preference of selected seats. There are near about 19 participating institutes of CSAB 2019. Aspirants who have not qualified JEE Main 2019 examination will not be allowed to take part in CSAB 2019. The registrations for CSAB NUET 2019 will commence from the third week of June, 2019 in online mode. For registration, applicants need to fill the required details. Allotment of seats will be conducted for candidates belonging to the 8 Northeastern states and 4 Union Territories (Arunachal Pradesh, Meghalaya, Assam, Mizoram, Manipur, Tripura, Nagaland, Sikkim, Dadar & Nagar Haveli, Daman & Diu, Andaman & Nicobar Islands and Lakshadweep). The seats are reserved for these applicants in Government and Private Engineering & Technological institutes. Admissions will depend on the rank obtained by the candidate in JEE Main 2019. Applicants must have secured a valid rank in JEE Main 2019. Candidates must also meet the eligibility criteria of JEE Main 2019. For participating in spot round, general category aspirants must have an aggregate of 45% whereas SC/ST category candidates must have an aggregate 40% in class 12th or equivalent examination. As first step candidates need to register using their JEE Main 2019 roll number and password. Applicants have to fill the choice of courses and colleges as per their interest and preference. The authority facilitates the candidate to rearrange, change or modify the filled choices before the last date of locking. Candidates are advised to fill a maximum number of choices in order to get a preferred seat. Once the candidate finishes with the choice filling, he/she must lock them before the given deadline. In case aspirants do not lock the filled choices then the authority will automatically lock the previously saved choices after the given deadline. Applicants must take a printout of the locked choices. The authority will allot seats to applicants on the basis of rank, choices filled and availability of seats. Applicants who will be allotted with seats need to download the seat allotment letter and also they must take a printout of it. The selected applicants will have to report at the Reporting centres allocated to them by the Central Seat Allocation Board. Candidates have to carry original documents along with them for verification purpose. Also, payment of counselling fee needs to be done by these selected aspirants. Upon successful verification, applicants will be provided with the provisional admission letter. At last aspirants need to report at the respective institute to complete the admission process and formalities. Central Seat Allocation Board will conduct CSAB SFTI 2019 to provide admissions under B.Tech courses offered by Self Financing Technical Institutes (SFTI). Applicants will be admitted in the institute based on the rank obtained in JEE Main 2019. Applicants with valid JEE Main 2019 score are eligible for CSAB SFTI 2019. Candidates belonging to general category must have secured 45% while candidates belonging to SC/ST category must have secured 40% in class 12th or equivalent examination. The minimum passing marks are as prescribed by the respective boards of the class 12th exam in each of the five subjects (Physics, Maths, Chemistry/ Biotechnology/ Biology/ Technical Vocational Subject, any one language and any one of the fifth subject) which are used for calculating aggregate marks. Candidates need to pay counselling fee of Rs. 21,000 by logging into the CSAB 2019 portal using JEE Main 2019 application number and password. Applicants have to make the payment through SB Collect on the portal of State Bank of India. Now candidates will be allowed to fill choice of colleges and courses according to their preference and convenience. Applicants have a facility to edit, rearrange or make changes to the filled choices before locking these choices. Applicants must lock their respective choices once they are filled before the closing date. If choices are not locked by the candidate then the concerned authority will lock the last saved choices automatically after the last date given for locking the choices. Central Seat Allocation Board will allot seats to applicants depending upon various factors which include rank obtained by an applicant, seat available and choices filled by an individual. The result for seat allotment will be announced via online mode and applicants are advised to download the provisional seat allotment letter. They must also take a printout of this letter for future admission process. The selected applicants have to report at the allotted institutes where they need to pay the balance fee. Applicants have to carry their original documents for verification process which will be done by the admisison authorities. In this step, candidates must complete all of the admission formalities. A supernumerary round of counselling CSAB UT 2019 will be conducted by Central Seat Allocation Board for aspirants who possess the state eligibility of Union Territories (Daman & Diu, Lakshadweep & Kandvi, Andaman & Nicobar, Dadar and Nagar Haveli). This counselling round will begin from the first week of August, 2019. The eligibility criteria set up for CSAB UT 2019 are prescribed below. Aspirants are requested to take a glance over the mentioned eligibility criteria. Candidates must strictly follow the state code of eligibility. This eligibility must be as per the JoSAA 2019 rules or as prescribed by the class 12th examination mark-sheet or as notified by the Union Territory. Applicants will not be allotted a seat while special round organized for filling vacant seats. The candidate must not have reported in the previously organized JoSAA rounds against the seat allotment. Candidates who are allotted the seat and report at the institute against it but withdraw before the sixth round of JoSAA 2019 counselling are also eligible. An aspirant who paid the initial fee (Rs. 45,000 for general category and Rs. 20,000 for reserved categories) and will be absent from reporting against the allotment is also eligible. The eligible applicants need to register by logging in using JEE main 2019 roll number and password. After getting registered, the candidate needs to fill preferred choices of courses and colleges. After filling these choices, applicants have to lock them before the given timeline else the admission authority will lock previously saved choices automatically after the last date of locking. The seats will be allotted to applicants based on the merit, preferred choices and availability of seats. After the seat allotment has been declared, applicants must download the seat allotment letter and take a printout of it for future use. Aspirants have to report at the allotted institutes for payment of fees and verification of documents. All of the admission formalities need to be completed during this last step. The special rounds of NITs, IITs and CFTIs 2019 will commence after completion of the seat allotment process of JoSAA 2019. The registration and choice filling will start from the fourth week of July, 2019 in online mode. The allotment will be available for applicants who have secured a valid rank in JEE Main 2019. 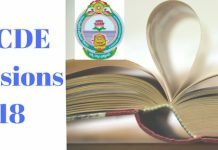 Candidates must have qualified JEE Main 2019 with valid scores. An applicant must have a registration of JoSAA 2019 else he/she will not be allowed to take part. General category aspirants must have scored 45% marks while Reserved category aspirants must have 40% in 12th standard or equivalent examination. The eligible applicants need to pay the counselling fee in order to register for CSAB 2019 special round for NITs, IIITs and CFTIs. Now candidates can register by entering JEE Main 2019 application number and password. Applicants need to fill choices of Courses and colleges as per their preference. These choices must be in the order of priority and candidates are advised to fill a maximum number of choices. After filling of choices, the candidate needs to lock then otherwise the admission authority will automatically lock the last saved choices. Central Seat Allocation Board will declare the result of seat allotment for round 1 via online mode. The authority will offer admission based on the merit of an aspirant and the selection of preferred choices. The selected candidates will have to report at the respective institute allotted to them for confirmation of admission.